other information Valley Entertainment VI 15013, 2000. 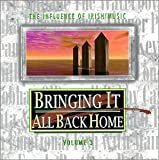 Remastered from recordings for the 1991 documentary film "Bringing It All Back Home." Not indexed here: track 1 (Equinox), track 2 (You Couldn't Have Come At A Better Time), track 4 (All Messed Up), track 6 (Thousands Are Sailing), track 7 (Cooler at the Edge), track 11 (Blue), track 13 (Don't Let Our Love Die), track 14 (Operator).